If you want a lasting, attractive flooring solution that resists moisture and looks great in kitchens, bathrooms and other rooms in your home, tile flooring is a classic solution. Tile has been used for thousands of years, but modern techniques offer more choices in finishes, colors and effects than ever before. Tile flooring is hard-surface flooring made of small manufactured pieces of material. Hard-surface tile floors tend to offer more structure than vinyl or softer materials, covering small imperfections in the floor and not necessitating as smooth a surface as vinyl. Tiles can last for years and are generally low-maintenance, easily cleaned with a vacuum, brush or mop. Tile floors offer many options. There are floors with even or uniquely-shaped tiles and tiles that have been specially treated to be moisture-, stain-, scratch- and slip-resistant. Tile floors can imitate the look of many natural materials — in fact, some are made from them. Two common types of tile flooring that are especially popular include ceramic and porcelain floor tiles. Ceramic tile flooring is made from clay or synthetic materials, often treated with heat and covered with a glaze or protective finishes. Today’s ceramic tile flooring can imitate stone, slate, wood and other materials and comes in a rainbow of colors. Ceramic floors are very durable and will work in even high-traffic areas. No matter what you spill on them, there’s no need to worry. Ceramic tile is waterproof, and it also resists stains, scuffs, dents, chips and scuffs. For high use, there are also finishes that make this already-tough flooring even more hard-wearing. Some tiles come with slip-resistant finishes to keep you safe. Porcelain is formed by heating synthetic and naturally-occurring materials at very high heat until they are hardened. Porcelain tile flooring is even harder and more durable than ceramic flooring and is heated at higher temperatures, making it very dense and more adaptable to a broader range of designs and styles. Porcelain tiles also have a very low moisture absorption, so if your room will get very hot and then very cold because you live in a cold climate, this tile may be very durable and will resist cracking when compared with other types of flooring. Porcelain tile flooring is an investment that will last for many years, even with lots of use. It’s easy to maintain and clean, and you never need to worry about spilling water on porcelain tiles since it’s water-resistant. This type of flooring does not retain allergens such as dust, mites or pollen, making it ideal for homes where individuals have allergies. 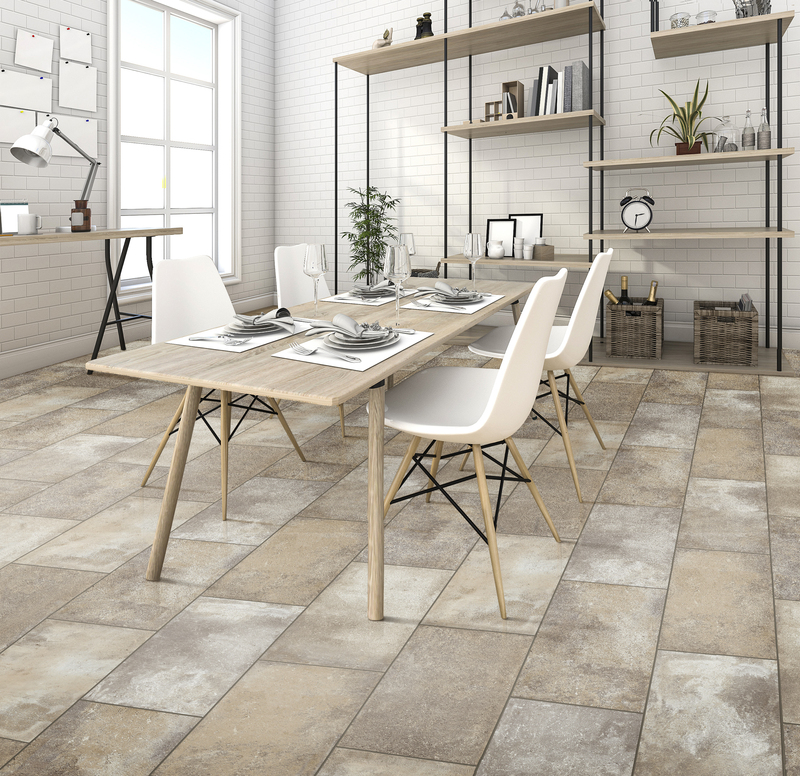 This quality also makes porcelain tiles a popular option for homes with children or pets. If you’re looking for quality tiles at affordable prices, contact 50 Floor. Unlike our competitors, we’ll come to your home for a free appointment. We bring the flooring to you, so you can see exactly how different finishes and colors look against your cabinets, walls and furnishings. We save you money and time by offering great pricing and by taking care of all the details, including timely installation. All you have to do is let us know which flooring you want! To get a beautiful new floor, schedule your free flooring appointment with 50 Floor today.